As I begin my last month as Episcopal Administrator I want to thank you all very much for your sustaining prayers in this long transitional period in the life of our Diocese. As I have moved around I have regularly met folk who have kindly assured me of their daily prayerful support as we have waited patiently to welcome our new Bishop. On 6 April 2019 Mark Short will be consecrated in St Saviour’s Cathedral Goulburn as a Bishop in the church of God and then installed as the eleventh Bishop of this great Diocese. As I said to the Bishop in Council recently, ‘installed’ is the word used in our Governance of the Diocese Ordinance even though it causes great mirth among many of us because of its connotations with furniture or pieces of equipment like air conditioning units. It is however much preferred to the old word ‘enthroned’ with its unfortunate connotations of regal power or the word ‘en-seated’ once floated in another Diocese as a novel way to indicate the Bishop is actually taken to his seat in the Cathedral. I can assure you I will resist the temptation to use a screwdriver on this occasion! This solemn yet joyful service will commence at 11.00am followed by a picnic in the Cathedral grounds. I do hope some people from every ministry unit and agency in the Diocese will be able to be present to warmly welcome Mark and Monica back to the Diocese in his new role as chief missioner in proclaiming the gospel of Jesus and the chief pastor and teacher of his flock. However, as I said last year to the Synod representatives, I want you all to moderate your expectations so that they are realistic. My experience in starting in new roles is that there are often some people who want your ear immediately and desire a quick decision about something they see clearly as important to them. My plea is that we be patient and graciously give him space and time to enter fully into his new responsibilities. This is a geographically large and complex Diocese with many demands and challenges. Although he will receive briefings he will not be all knowing and across every detail instantly. He will not necessarily know what to do immediately in each situation he confronts. Nor will he be able to be in two places at the one time and moreover he will have the same number of hours in each day as we all do! We need to lovingly cut him some slack as we continue to work collaboratively together for the health of God’s church and His mission in our Diocese. Remember God is always graciously merciful to all those who genuinely and wholeheartedly repent. He shows compassion to all returning prodigals. He loved the world so much that He gave His only Son. The cross reveals the character and the heart of God, and this Lent we need to mourn those failures and shortcomings that made it necessary for God to pursue such a drastic solution. We need to confess any sin; any lack of faith; any lack of love which excludes those that are different; any self-righteous judgementalism; any lack of concern for the poor and the marginalised; and any propensity to polarise on things which are not essential to salvation through faith in Jesus Christ. In fact we need to turn away from anything which makes the watching world say disparagingly where is their God? 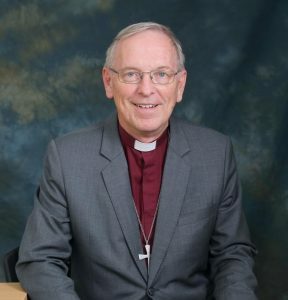 Thank you Bishop Trevor for all your love and care for all people of this Diocese. You have had an incredible ministry and such a big workload in the latter years. Thank you for all you have done for our Parish. Thank you Bishop Trevor for all your valuable time you have spent with the congregation at St.Pauls in Temora. May God bless you both in your retirement.